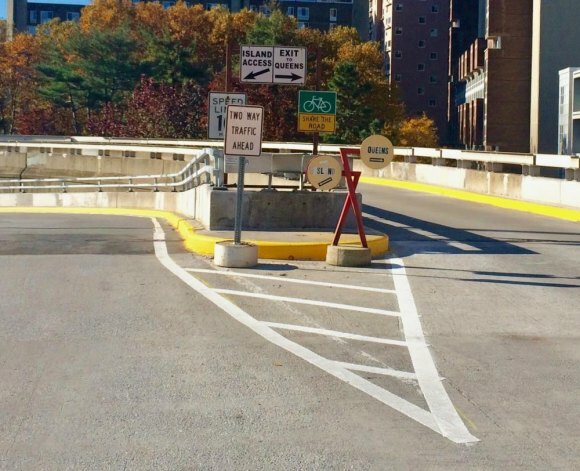 Existing bike lane offers easy access to Motorgate and the street via ramp or elevator. 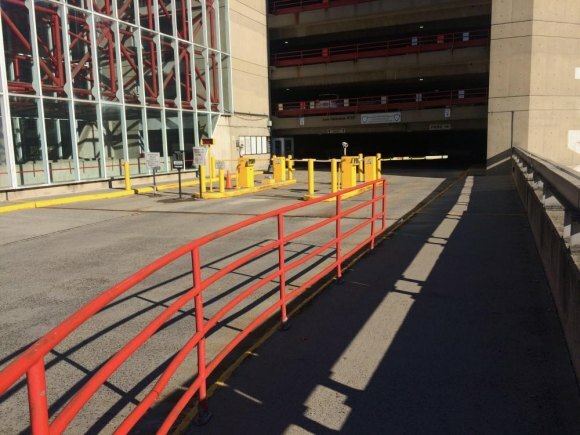 Even for spendthrift RIOC, the colossal waste of public money dumped into the "RI Bike Ramp" is spectacular, a boondoggle so extreme it ought to be investigated. Who is this extravagance supposed to benefit? 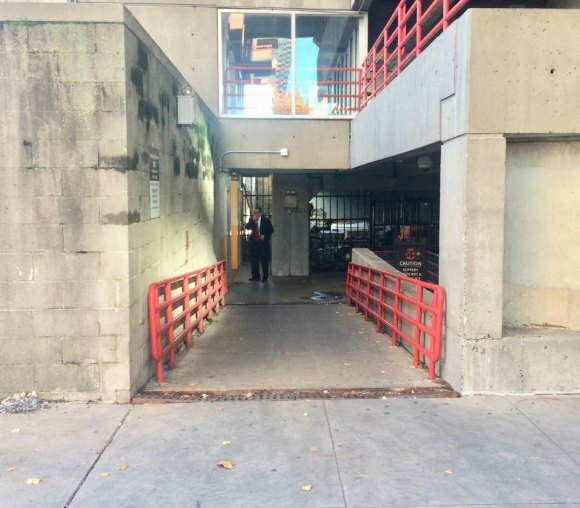 How insane is spending for the Roosevelt Island Bike Ramp? You don't need to go far beyond Roosevelt Island to witness how dazzlingly extreme this is. It's this simple: In 2010, the deteriorated and unreliable Tram was rebuilt, new cars, new platforms, new cables, new mechanical systems, top to bottom. The price tag was $15 million. For a bike ramp where viable alternatives already exist, RIOC's planning to spend almost as much, $14 million. Main Street could get a lot of snazzy sprucing up for that much cash. And it would actually help just about everyone, not a handful of bicycle riders. Gather up ten average Americans, scoop up their lifetime earnings before taxes and take it away from them. That's what RIOC's tossing into the pot for a bike ramp to shadow the bridge helix. That's $14,000,000, folks, and you can't keep the change. Or, buy actor Dennis Quaid's Montana fly fishing getaway ranch for only the same $14 million. Don't like fly fishing and/or Montana? How about this California wine country beauty from Sotheby's? "...13 buildings, 187 acres of woodland, 4 fireplaces, 1 vineyard, 1 wine cellar, 1 bocce court, 1 gym, 1 pool and spa, 1 zip line, 1 tree house, 1 play fort (after reading the past three features, our 8-year-old selves are sold), 1 putting green, 3 miles of walking trails, all for a mere $14,000,000." A minute or so coast down the levels leads to an exit on Main Street. Use the crosswalk for quick access to the scenic West Promenade. Like Governor Andrew Cuomo's East Side Access Project, the Buffalo Billion or the three stop Second Avenue Subway, the costs are too colossal relative to results to easily comprehend the nuttiness. Two things you can be sure of: Dig deep enough and you'll find an entity that contributes to Cuomo's campaigns benefiting. You probably won't have to dig all that deep. You can also be sure it'll never come in at $14 million or less. RIOC projects almost always run over budget and well past projected completion dates. RIOC says this baby will take four years. Yes, for a bike ramp. To be fair, it's not that easy to blow that much money. You have to spread it out over a few years. Why do we need a bike ramp? Today, bicyclists enjoy multiple Island access options. A lane leads from the bridge directly into Motorgate where elevators await at either end. Energetic riders can also coast down to the lowest level and exit across from 40 River Road. 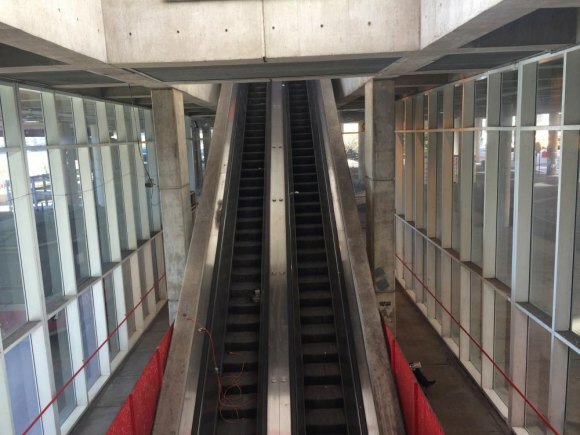 RIOC could do us all a favor by fixing the Motorgate escalator. Wanna bet it'd take less than $14,000,000? Glide down, hop straight out to the East Promenade. It's probably too much to expect RIOC to fix the ugly escalators, now caked with filth in the Motorgate atrium. The excuse for not doing it was always that repairs were too expensive. Wanna bet it'd cost less than $14,000,000? And, of course, there's the obvious. Why not coast on down the helix? Maybe RIOC could invest ten bucks to improve the bike share sign that's now obscured in a welter of confusing signs no driver could hope read in the time available. Maybe PSD could actually enforce the 10 mile per hour speed limit, make it safe for everyone. Let's see now. That leaves us with $13,999,990 left over for lunch. On RIOC. For everybody. Still lots of cash to squander. Metal spaghetti makes traffic signs nearly unreadable for drivers, but what we see is a ramp for bikes and cars with a safe 10 mph speed limit. For nothing. Last count, 34% of Americans say they've had a bike ride in the past year, but only 5% say they do so at least once a week. So, say we're average, a fair enough assumption: 600 Roosevelt Islanders get to enjoy the $14 million ramp, if we want to go off-Island. That's a benefit of $23,333 for each likely bicyclist. What is it about the East Side? is a question RIOC tosses out there as part of the sell. Unless you're goofy for the rear of Roosevelt Landings, which dominates the East Promenade. And you've got the scenic view of the Ravenswood power plant. Bikers can watch it get bigger every day. The Promenade terminates before things get really interesting in Southpoint and FDR Four Freedoms Park. How did RIOC's ever acquiescent Board approve this thing? Isn't it their job to oversee the budget and expenditures? Who's asleep at the wheel? Who's gonna volunteer to wake them up?